Over the past few of weeks, I've enjoyed reading a couple of posts on Six Until Me about people who've found innovative ways to do diabetes fundraising. And it got me thinking about "my" socks. My story isn't as inspiring as those featured on Kerri's blog, but I thought it would be fun to share it with you anyway. As I've mentioned before, I knit. (Okay, I knit a lot.) And I might have a bit of yarn. Well okay, maybe I have around 98,000 yards (that's over 55 miles) of yarn. No, I'm not kidding. I have it all logged in an excel spreadsheet. (dork) With columns that add up the yards and also convert it to miles. (super dork) And that doesn't even count a few more skeins I picked up on vacation that still need to be logged in. (obsessed dork) But I digress. Two years ago, Pea and I decided to participate in the ADA Walk-a-thon. One of the first things I did was to put up a post on my knitting blog. I was overwhelmed by the response. Knitters not only began donating immediately, but they also posted about it on their blogs - and soon donations were coming in from people I didn't even know. They also donated yarn and other knitting loot so I could raffle off prizes to people who donated. I had set my fundraising goal at an amount that I thought was unreachable - $500. In just a couple of weeks, we had passed that goal. But wait, I haven't even gotten to the best part yet. One of my blog friends was just starting to design her own knitting patterns. And she decided to donate her first sock pattern to me. She named it Karen's Sugar-Free Walk Socks, and donated the entire proceeds from every pattern sold until the walk-a-thon to my walk. 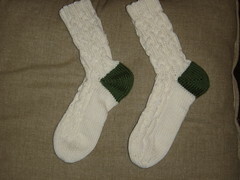 I proudly walked every step of the walk-a-thon in socks I had knit myself, from a pattern named for me! In the end, she sold 90 copies of the pattern, and donated $450 to my walk. That brought me well over the top of my new unreachable goal of $1,000. Hang on, it still gets even better!! To this day, Chrissy continues to donate $2 to the ADA each time that pattern is sold. It's so amazing to me that someone would be so generous with their talent. I am extremely proud to be able to think of that pattern as "my pattern" - and I get such a thrill every time I come across a pair of "my socks" on a knitting blog. I truly hope the pattern continues to be a hit, until the day when a cure for all of us is found. And yes, Pea and I are walking again this year, in October. I don't think I'll have a cool fundraising story to go with this walk . . . . but hey, you never know! I think your pretty awesome! I've always wnted to learn to knit, but could never find anyone to teach me because I'm left handed. Maybe purchasing your pattern ins a good way for me to finally get the ball (of YARN) rolling! That is one of the coolest inspiring stories I have ever heard. Keep up the great work!!!! That is such an awesome story!! But where does one keep 55 miles of yarn? Do you have an entire yarn room?? I always wished I could knit, but I never got very far in my endeavors. Karen, I vote for you knitting more pockets like the one you made when you got your pump. I would defnitely buy one for mine! This is so great Karen!!! Love the picture of the socks too. They look comfortable. I am walking in the Step Out: Walk to Fight Diabetes in October, would love to donate to your walk and wear a pair of your socks for my walk!!! Let me know how! ;-) Btw, I cannot knit....ha ha. Pockets for your pump??? Pictures? I would love to see what you have knitted for your pump. Please share. And what a great story, how it all started and how those continue to contribute and help out. Keep up the good work! Hey sister. Um.......I did not know you had a separate db blog......duh. Anyway, that is an awesomely cool story. I love it. I think I mentioned to you that I have never knit a sock (and don't see myself doing so in the near future). But, one never knows. The Republic National Convention will be taking place in downtown St. Paul, where I work. Today in the Ravelry Mn Knitters group I discovered that 6 fabulous yarn shops are going to have a "yarn collective" temporary shop just two blocks from my work! (Yes they are trying to fill up the vacant storefronts so St Paul looks like a vibrant city). I have already decided to take my backpack on wheels and hope over on my lunchhour. I love it! That's so cool. I'm not really accomplished enough in my knitting to try socks yet though. :) It makes me nervous. How amazing is that!?! Too cool! I knit, too, but I can only do scarves :( Maybe one day I can venture on to something more complicated, haha!